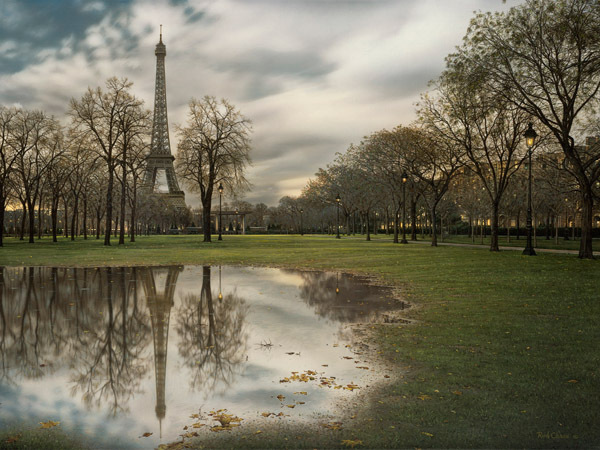 Chase's beautiful image gives us an amazing landscape and a unique perspective of the Eiffel Tower. For Paris and its citizens, nothing is more iconic for their city. The ornate, soaring structure pierces the skyline of the City of Light with an imposing, graceful, grand gesture for the world to behold. Construction of the tower began in January 1887, and it opened on March 31, 1889 as the entrance to the 1889 World's Fair. The tower is named after its engineer, Gustave Eiffel, whose company designed and erected the tower. It is one of the world's most recognizable structures, rising 1,063 feet, with three levels for visitors, and restaurants on the first and second levels. In its beginning, the tower had many critics; some protested that it would be hideous and ruin the Paris skyline. Undeterred, Gustave Eiffel presented his aesthetic argument, "Does not the laws of natural forces also conform to the secret laws of harmony." Thus, construction began. During construction, Eiffel took every precaution to insure the safety of the workers, and only one life was lost during the building of the tower. Today, the tower is considered a striking piece of structural art, and in 1964 it was declared an historical monument. The tower is also used for radio and television broadcasting, with communications equipment at the top. The tower has had over 250,000,000 people visit since construction. For those who tour the Eiffel Tower with its glorious views of Paris, their memories last a lifetime.